This page will hold links to Storage Field Day 9, due to be held in San Jose, California, USA, 16-18 March 2016. I am attending as a delegate. What: Gestalt IT Storage Field Day #9, invitation only vendor/blogger presentations event. Day 1, NetApp and Plexistor. Predicting the Future with Dave Hitz of NetApp from Stephen Foskett on Vimeo. 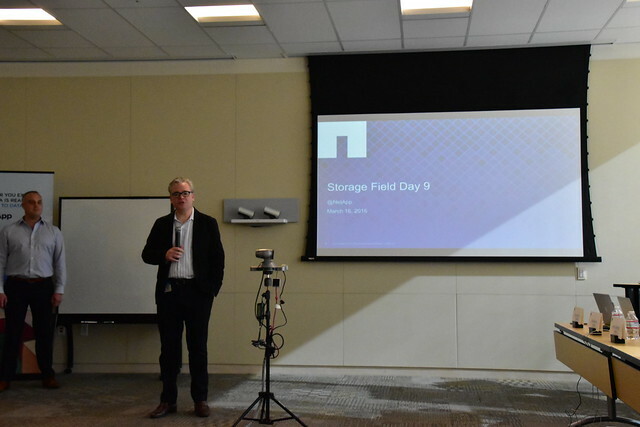 NetApp Data Fabric Strategy and Integrating the Product Portfolio from Stephen Foskett on Vimeo. NetApp OnCommand Cloud Manager Demo from Stephen Foskett on Vimeo. Coming Clean: The Lies That Flash Storage Companies Tell with Dave Wright of NetApp/SolidFire from Stephen Foskett on Vimeo. A Short History of Plexistor from Stephen Foskett on Vimeo. Plexistor Product Overview from Stephen Foskett on Vimeo. Plexistor Performance Deep Dive from Stephen Foskett on Vimeo. What Is Plexistor? from Stephen Foskett on Vimeo. Plexistor First Principles from Stephen Foskett on Vimeo. Plexistor Use Cases from Stephen Foskett on Vimeo. High-Performance Object Stores Roundtable at Storage Field Day 9 from Stephen Foskett on Vimeo. Object Store Backup Roundtable at Storage Field Day 9 from Stephen Foskett on Vimeo. Backing Up the Cloud Roundtable at Storage Field Day 9 from Stephen Foskett on Vimeo. Violin Memory Product Overview and Roadmap from Stephen Foskett on Vimeo. Violin Memory Concerto Software Stack from Stephen Foskett on Vimeo. Violin Memory Symphony Software Demo from Stephen Foskett on Vimeo. Violin Memory Supportability and Serviceability from Stephen Foskett on Vimeo. Violin Memory Stretch Cluster Architecture and Use Cases from Stephen Foskett on Vimeo. The Evolution of Silicon Flash with Violin Memory CTO Jon Bennett from Stephen Foskett on Vimeo. Intel What Is the Value of Your Data? from Stephen Foskett on Vimeo. The Physics of Silent SSD Errors from Stephen Foskett on Vimeo. The Software-Defined Storage Transformation with Intel from Stephen Foskett on Vimeo. Intel Cache Acceleration Software from Stephen Foskett on Vimeo. Intel Ceph, Swift, CoprHD, SPDK, and NVMf from Stephen Foskett on Vimeo. Cohesity Welcome and Update from Stephen Foskett on Vimeo. Cohesity Platform-First Philosophy from Stephen Foskett on Vimeo. Cohesity Interface, Data Protection, and DevOps Demo from Stephen Foskett on Vimeo. Cohesity Cloud Integration from Stephen Foskett on Vimeo. VMware Virtual SAN Overview from Stephen Foskett on Vimeo. What Is VMware Virtual SAN? from Stephen Foskett on Vimeo. VMware Virtual SAN 6.2 Features and Enhancements from Stephen Foskett on Vimeo. VMware Virtual SAN Space Efficiency from Stephen Foskett on Vimeo. VMware Virtual SAN Performance from Stephen Foskett on Vimeo. VMware Virtual SAN Operational Model from Stephen Foskett on Vimeo.